This is just a very weird day. 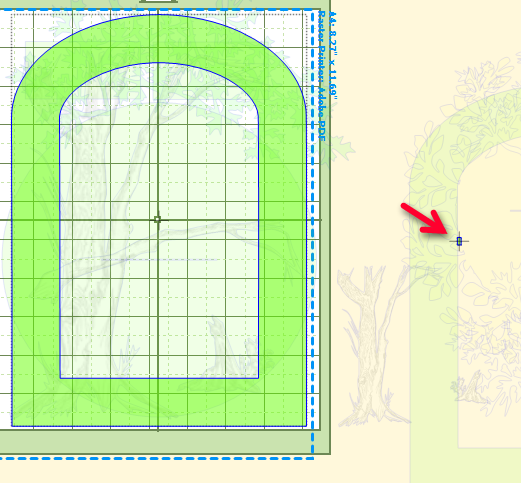 So on the first layer of attached file when I bring in a rectangle to make a slice within the arched shape, the rectangle is coming with something that looks like a small "D" way above the rectangle which causes the bounding box to be too large to cut when it is Boolean joined. I can't get rid of that little "D" either. Now what did I do that is causing this all of a sudden? Are you select just the 2 shape eg select one hold shift and select the 2nd Or are you using select all ? I notice a small rectangle off mat? @Crazy_Mr_Zing The minute I dropped the curser what I was talking about disappeared so I couldn't take a snap picture of it. But I finally had an idea to move the entire arch and shape I was trying to join way down away from the top edge of the screen and it finally worked. So I guess the lesson for me today is (besides learning to STOP when it gets too frustrating!) is not to try to work too close to the top of the cutting area. Thanks for your help, as always. So grateful you are still here. It worked Sandy. At this stage I am pretty shocked....was convinced I should toss the whole file. How did you know it needed importing to Scal? Experience I expect? What does Scal do for you that MTC doesn't, besides fix mistakes I guess. Not too excited about having to learn another program when I don't know half of MTC features yet. I just decided to test it in SCAL to see what would happen. Before MTC, the KNK's shipped with KNK Studio. Same kinds of random things would happen with it... not often but a few times a year a customer wouldn't be able to successfully cut something. So, when MTC came out with KNK plugins, I would always test files in MTC if there was an issue in KNK... and vice-versa. What I've learned is that typically if there's a strange thing I can't figure out in one program, it doesn't even happen in the other. But if I start trying things like Break and Join, in the "good program", it will fix the file... for whatever reason.